Poderopedia is an interesting concept. It’s a social network map of powerful people in one country or another. It started in Chile, which is a good place for it. Chile, despite scoring well on some measures of social mobility, isn’t really all that mobile at the very top end. The billionaire class is compact, made up of a long-lived oligarchy with massively overlapping interests. The social network map is crucial to understanding the country. We’re talking here about a country where the main respectable newspapers, El Mercurio, La Tercera and La Segunda, all devote multiple color pages EVERY DAY to social event photos. Social pages are, essentially, social network maps: who was talking to whom, and where. This entry was posted in Uncategorized and tagged investigation, venezuela on May 21, 2014 by Steven Bodzin. that nobody mentions that the US already imposed sanctions on Venezuela’s state oil company, back in 2011. It has also imposed targeted sanctions against several members of the government for allegedly being drug kingpins, from this one in 2008 to one just last year. Despite warnings that Hugo Chávez would use these sanctions as a means to attack the US in rhetoric and blame the US for Venezuela’s failings, Venezuela’s response was muted from the start, and has fallen so silent that these sanctions now go unmentioned by everyone: scholar David Smilde of WOLA and Tulane University, who argued today in the Washington Post against sanctions; US Asst Secretary of State Roberta Jacobson, who recently said that the US had been asked by the Venezuelan opposition not to impose sanctions on Venezuela; Sen. Marco Rubio, who is pushing specific sanctions against individuals in the Venezuelan government; and even Chavismo’s top English-language polemicist, Eva Golinger. I think anyone arguing that Maduro will use US sanctions to bolster his position needs to explain why he hasn’t already done that. Here’s what I think: the Venezuelan people aren’t stupid. Even die-hard government supporters know there are some awfully corrupt people in their government. People from the political right might say corruption is a natural facet of central planning and socialism, those from the center might blame history or say Venezuela has always had its bad apples (mangoes? ), and those on the left call the corrupt ones the “derecha endogena” and blame them for halting the revolution’s progress. Different diagnoses, but they can agree on the presence of corruption. They know that the country’s problems don’t come from a few US sanctions against unpopular individuals and light sanctions on PDVSA. I don’t have an opinion on whether the US should impose sanctions on supposed human rights violators from Venezuela, but I wish those debating would recognize the status quo for what it is. This entry was posted in Uncategorized and tagged pdvsa, sanctions, usa, venezuela on May 20, 2014 by Steven Bodzin. Somehow I missed that PDVSA was building a power plant in Bolivia. 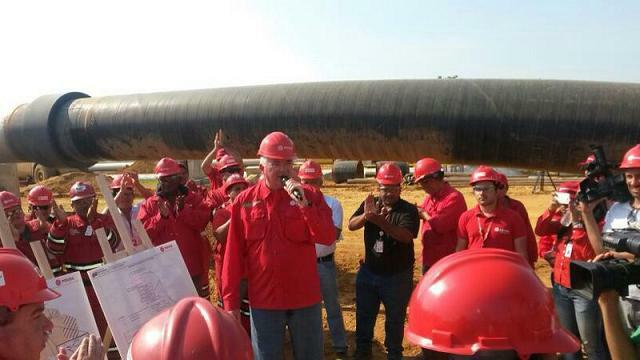 May 19 2014, Santa Cruz, Bolivia – The CEO of PDVSA in Bolivia, Darío Merchán, said the construction and assembly of the Planta Termoeléctrica del Sur, in Tarija, entered its final phase and its launch is forecasted for June… Termoeléctrica del Sur is a project of the joint venture Empresa Nacional de Electricidad Andina and required a $122 million investment, financed by the Bolivian Central Bank (BCB). …160 megawatts…inauguration in a matter of weeks…Energy consumption in the country is rising to 1,200 megawatts and supply is 1,400 megawatts, leaving a 200 MW reserve. Merchán emphasized that the Termoeléctrica del Sur will bring Bolivia closer to its goal of exporting electricity in the medium term. Now all they need is a power line to the llanos, and Venezuela will be ready for El Niño. This entry was posted in Uncategorized and tagged bolivia, electricity, pdvsa, venezuela on May 19, 2014 by Steven Bodzin. While North American greens spend all their energy fighting against Keystone XL (and driving crude oil onto exploding freight trains) Venezuela is getting ready to commission this. This is a 153-km, 42″ oil pipeline with a capacity of 750,000 barrels a day of high-sulfur, high-carbon, processing-intensive oil. It will one day take oil from Venezuela’s quiet, biodiverse Orinoco Belt to the largely pristine Caribbean coast. There the oil will be partially refined (upgraded) into higher-quality crude. Upgrading is the removal of petroleum coke and sulfur. Those unpleasant byproducts sit in great heaps near the sea until they are sold to industrial users around the world. Concrete-makers love Venezuelan petcoke because it is a high-energy fuel for their kilns, never mind that it’s very carbon-intense. This entry was posted in Uncategorized and tagged Keystone, oil, pdvsa, venezuela on May 19, 2014 by Steven Bodzin.